While swatching the brand new Milani Fierce Foil collection, I found my snowflake nail vinyls and thought that the colors would lend themselves nicely to a little winter nail art. 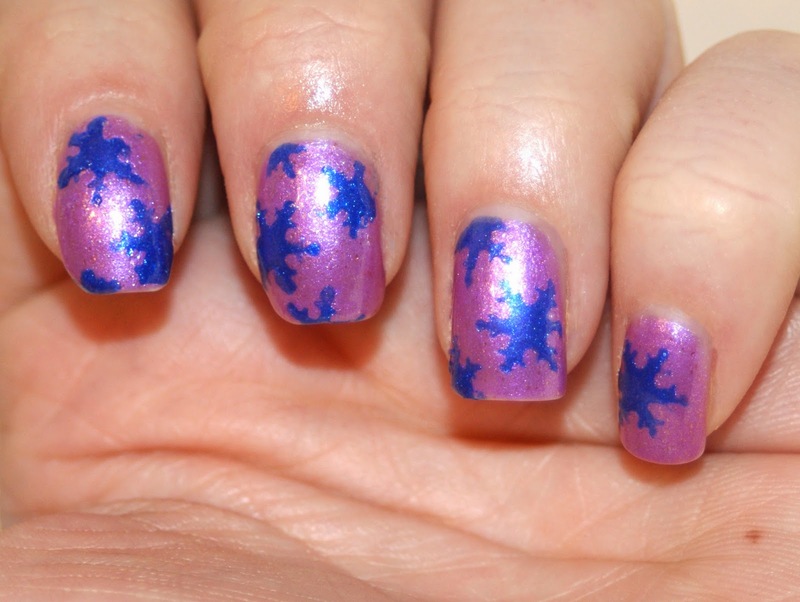 Milani Venice is a cobalt blue metallic polish that I used for the snowflakes and Milani Rome is a metallic orchid that I used as the base. I really liked how wintery these came out with the combination of colors, but also the metallic shimmer. It's still colorful, but icy in a way. I really loved it. And even though these are metallic, I had no issues with staining or removal. These came off really easily. Stay tuned for a full review of the entire Milani Fierce Foil Nail Lacquer collection later this week! In the meantime, you can find these two shades at your local CVS for $3.99. But act fast! These are limited edition! These are fun shades together! I'm definitely going to check out CVS soon! Perfect shades together! I need to play with mine now! These shades go so well together! Love the snowflake detail! My suggestion is to post various and different type nail art articles?